I awoke a few times through night to an exultation of stars peeking through the canopy and very late a thin moon made it over the valley walls. After a my nights sleep with the ever present white noise of the river, I woke to a grey morning with mist streaming down the valley walls. Over the course of a morning spent in contemplation down by the river and making breakfast in camp, the mist burned off to mostly clear blue skies. While I was breaking my fast a volunteer ranger came by and gave me the skinny on day hikes in the area. 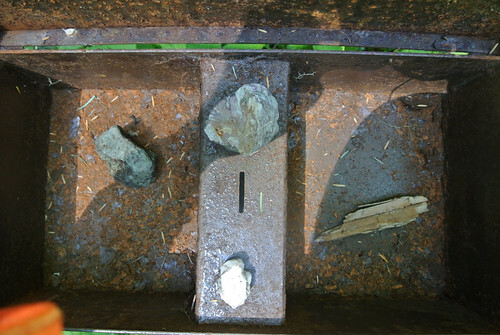 He also let me know that most of those washouts I had to clamber over one the way here were from this year. It had been the rainiest winter on record in Washington State and it brought down a lot of rocks. I lingered in camp until after lunch and then hoisting my daypack I set out to checkout the local trails. Past the campground is the old ranger station and then past that begins the trails. There is a the remnants of an old nature trail which does the traditional loop, with a branch off of it into the broader trail network. 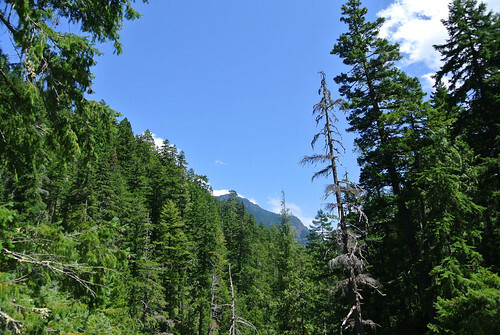 The trail heads off up the river valley to the Dose Forks campground. This is a true backpackers campground, a few miles from the Dosewallips Campground, which was the furthest in you could have driven back before the washouts. There were a few people camping at Dose Forks though I didn’t seen any of them there. 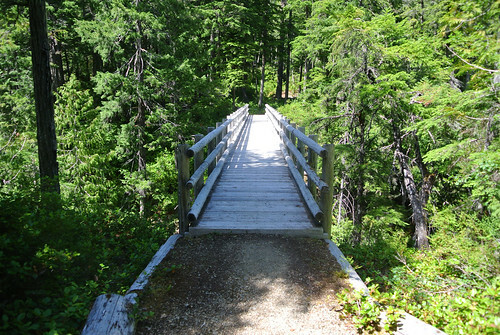 I was continuing up to what the ranger had described as the High Bridge at the West and North Forks of the Dosewallips. Between the two campgrounds I was up the valley walls a ways and primarily hiking in the woods. 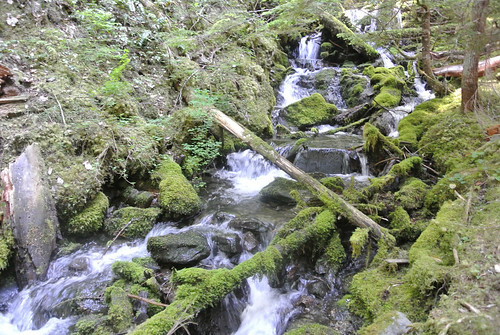 There were numerous creeks to cross — Station Creek, Pass Creek and named trickles — but I was far enough away from the Dosewallips that it was only a very distant rushing sound. At Dose Forks Campground I was back right on the river and had to cross it to continue on the the High Bridge. The character of the hike there was subtly different. It was more rocky and I was clearly on a sort of spit of land between the two forks of the river. 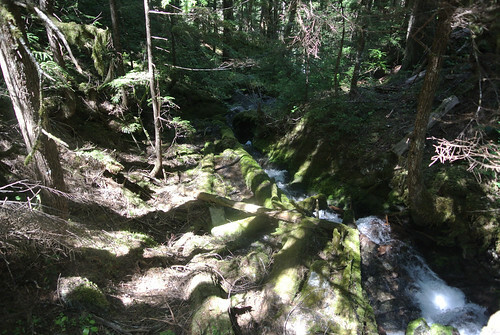 There were a couple more little stream crossings which the trail often descended to cross and then had to climb back out. This part of the Olympic National Park, cut off from the car campgrounds, seems to be slowly returning to nature. Rangers have to hike anything in and the old car campgrounds are slowly deteriorating. Nobody is going be be packing in a replacement picnic table! 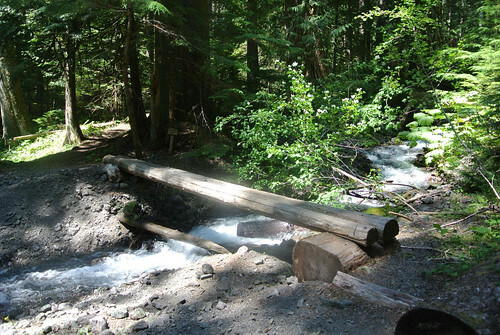 Out here though it is the trail crews that keep falling logs off the trails, bridges from collapsing and the trails generally clear. Past the high bridge there are trails deep into the Olympics and it hooks up to the cross park — and state! 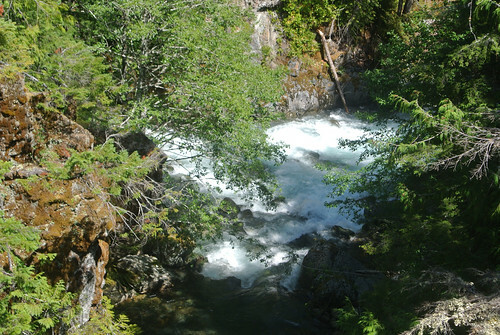 — Pacific NW Trail. There was sign of these trail keepers all through these hikes, cut logs, repaired bridges and general trail clearing. This corner of the park feels pretty abandoned. I’m sure it was never was the draw that the Hoh, Hurricane Ridge, Lake Quinault etc have been, but with no car camping now, it feels pretty remote. The High Bridge is well named, a solid wood bridge on a rocky promontory crossing the West Fork of the Dosewallips. Looking east you can just see where the North Fork cascades in and merges with the West Fork. 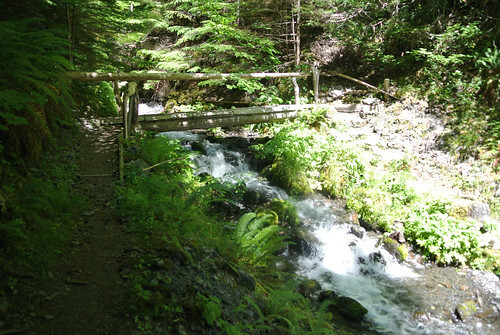 I spent some time on the bridge and around the branching trails just past it. I rested, ate a sandwich and just existed. A wind had picked up and there were ragged trails of cloud reaching into the piercing blue sky. I just sat and listened for a spell until finally I retraced my steps back to camp.